TE-11WZ 25-60x Wide Zoom Eyepiece is rated 4.9 out of 5 by 22. Rated 4 out of 5 by ger from Mostly good Overall I'm satisfied with the KOWA TE-11WZ which I bought for use with the KOWA TSN-884 spotting scope. AFOV ( Apparent Field Of View ) my estimate is plus 60 degrees at low zoom and well in excess of 70 degrees at high zoom and sharp to the edge. No noticeable CA ( chromatic aberration ). Focus must be adjusted slightly when zooming. Mine has a piece of flotsam somewhere internally near the edge of field but I only notice this when I hold the eyepiece in hand up against a bright light. I was hoping to use the eyepiece with my 8 inch astronomical telescope but it does not fit into the 1.25 inch holder. With a suitable adaptor it could be used with a 2 inch eyepiece holder. Rated 5 out of 5 by laserado from Perfect companion for my Kowa scope! Zooms in nicely on those far off water birds! Rated 4 out of 5 by David C. from Great Quality Optic This eyepiece works great for spotting of shots on long range targets (over 1 mile). It provided very adequate image resolution and had plenty of magnification for my needs. The field of view is wide as advertised but I wished for a tad bit more eye relief. I had to get too close to the ocular lens to get the entire field of view especially at the higher magnifications. Rated 5 out of 5 by Keith from Excellent eyepiece I got this eyepiece for the Kowa 883 and also bought the Zeiss Conquest for comparison. This eyepiece was much better. the zoom was very fluid and easy to use with just the right amount of resistance. Even though it is 25x-60x and the Zeiss is only 30x-60x, it was not the deciding factor and made only a little difference. The Zeiss eyepiece was very stiff and took much more force to zoom than the Kowa Prominar. Definitely worth the money. Rated 5 out of 5 by subtrop MJ from Best zoom for eyeglass wearers I'm a birder, and this is about my 10th eyepiece on six scopes over 40+ years. 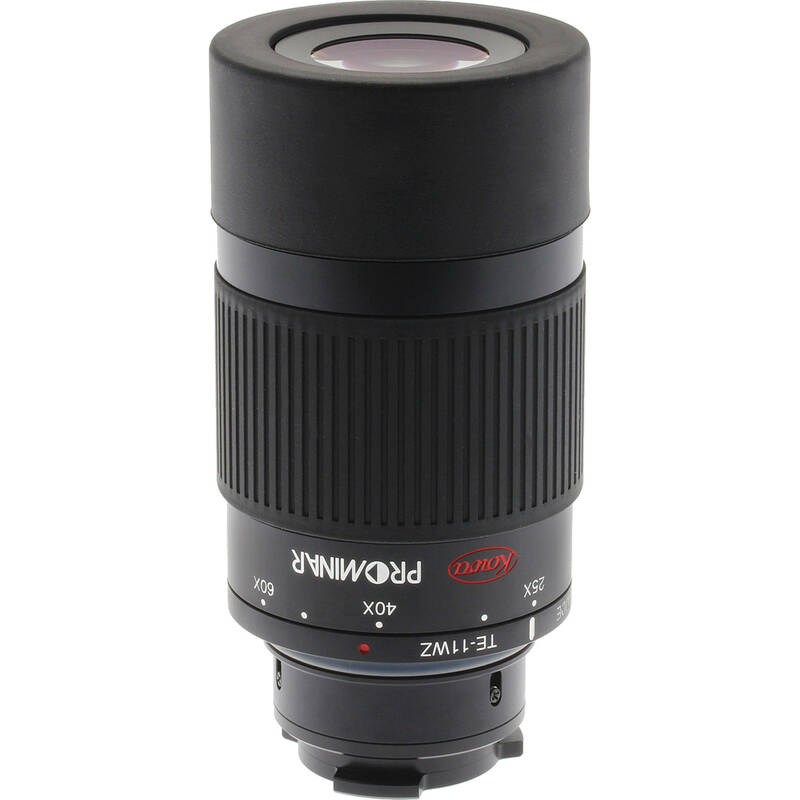 Prior to purchasing the Kowa 883 and this eyepiece, I owned a Zeiss Dialyt 85 (now discontinued), which was an excellent scope but had a zoom eyepiece that was not friendly to eyeglass wearers. ?The Zeiss zoom had insufficient eye relief and caused extreme loss of field of view above 30x (I used the Zeiss 40x fixed power, which worked fine but a zoom is very useful). ?The Kowa zoom only slightly diminishes field of view in the mid-range. ? In addition to the FOV issue, this eyepiece in combo with the 883 is noticeably sharper and brighter than the Zeiss, and the Zeiss was no slouch. ?I've also compared this, side to side, with a Swaro 80, and the Kowa is better. One minus - the first eyepiece I received was defective, it had a noticeable ?clunk in the zoom at about 57x. ?B&H gave me a no hassle replacement and it operates perfectly. Rated 5 out of 5 by Jeri from This is a WOW I put this on my KOWA TSN 883 scope and it produces a WOW viewing experience. What a clear, crisp zoom. I'm an avid bird and wildlife viewer and have had the opportunity to look through the top brand scopes from friends who own them and compared to my experiences looking through their lenses this is exceptional in every way, in all kinds of lighting conditions. Rated 5 out of 5 by Alex from The best! This is the best eye piece you can buy! Rated 5 out of 5 by matt from great eye piece this scope is very clear the best i have ever seen evin with full zoom. giveing me the ability to see thinga at 60x that I could not se with other scopes zoomed in more, as much as 75x. I only wish Kowa mande one that zoomed in more like 75-100x as the glass is capeble of maintaining clerity. To attach this to a sony a6000, do I need a T mount adapter? If not how can I do it? You need the KOWA photo adapter (B&amp;H #KOTSNPA7) and a T-mount adapter. The TE-11WZ is used with the adapter and note that the adapter has a glass barrier inside to protect the camera sensor. I started with the TE11Z 25-60 eyepiece. It seems to me the upgrade is minimal. But I am not by any means an expert. What is the diameter of the eye piece please? The diameter is 2 1/8 inches. Is there an adapter to use this eye piece with a tsn-823? I believe there is an adaptor to accommodate an iPhone, but I haven't bought or tried it yet. Enjoy your beautiful scope. Hi. Could I attach this to a Panasonic G7? If so how can I do it? Thanks.